My employer's user conference was a perfect time for me to try OPI It's Totally Fort Worth It because the light grey coordinated perfectly with the company logo shirt I had to wear. 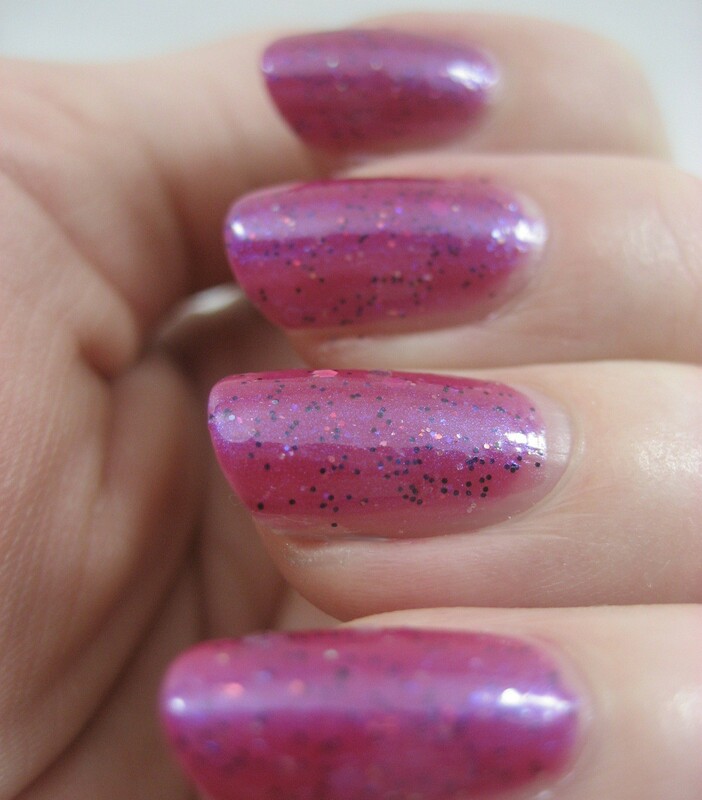 I thought the pink shimmer I could see in the bottle would reassure people who are not overly comfortable with "odd" nail polish colors, a feature my choice for this event last year, OPI Sheer Your Toys, did not have. As it turned out, the pink shimmer mostly hid on me, so 98% of the time it just looked grey. Slightly brushstrokey grey at that. This is three coats plus top and base. In very bright light, I could see flashes of pink. Most of the time, I am not in very bright light, so this was disappointing. I found this very underwhelming. So much so that I didn't even wait for my regular polish change day but added glitter as soon as I was done at the conference. I used Pop Beauty Twinkle, which I ordered from beauty.com after seeing it on Jenni's blog. One coat of it plus topcoat over the blah grey perked things up nicely. In indirect light, Twinkle shows mostly silver and rose, but get even a little direct light on it and there are rainbow sparkles everywhere. 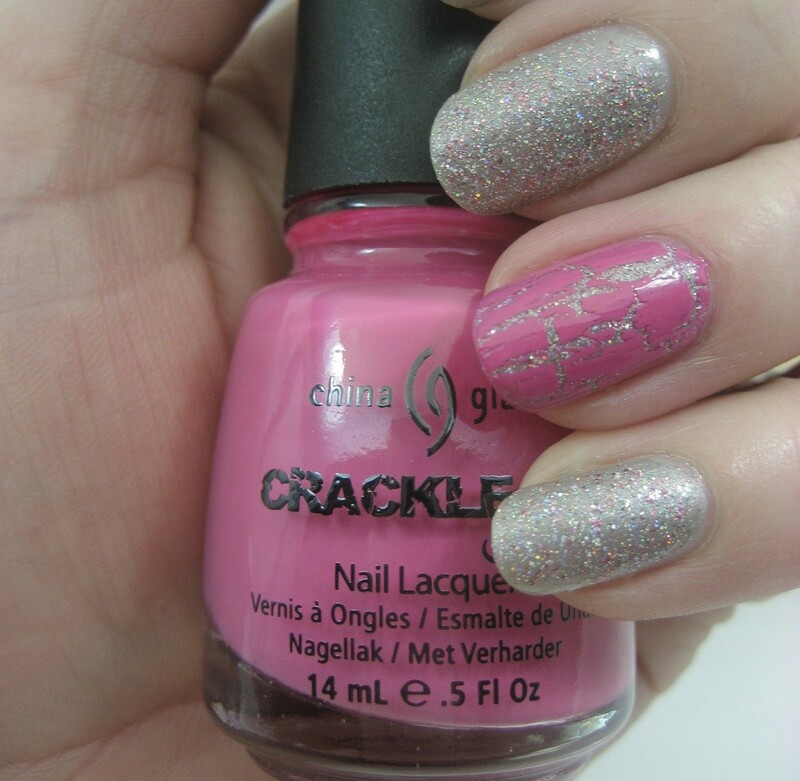 Pretty as Twinkle was, I could not leave it alone, and added some accent nails of China Glaze Broken Hearted (and more top coat). 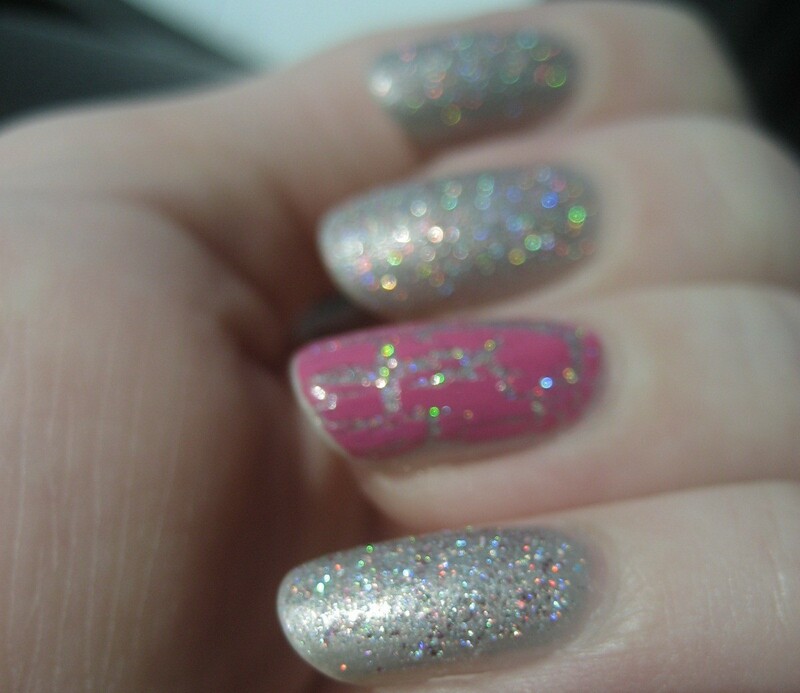 After frankening two shimmers in a row, I had to get some glitter action going. My main ingredients for this one were Revlon Galaxy and Nox Twilight Sugar Plum with just a hint of Confetti Tiara. 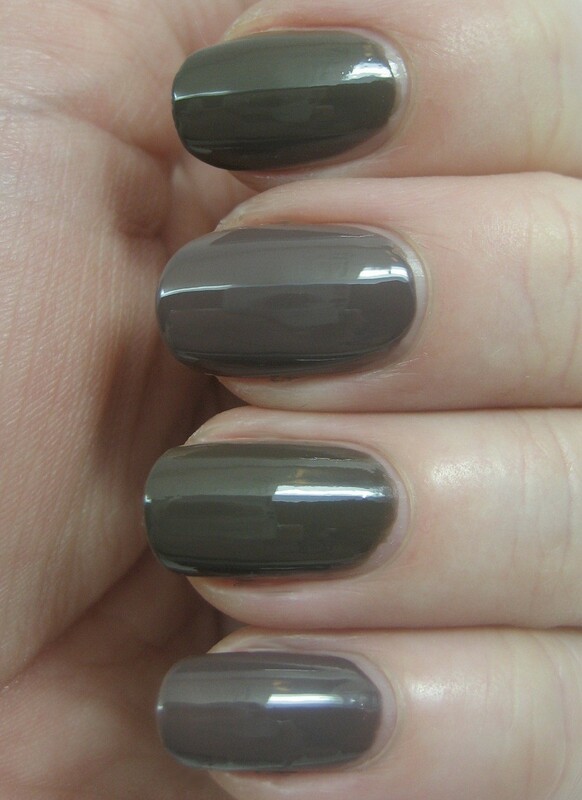 These swatches are three coats, no top coat (though I think it could use some). This has some of the black pepper sprinkles look to it, which is not my favorite, but since it's obscured somewhat by the shimmer it doesn't bother me as much as it would otherwise. I wish I'd thought to layer this over a vampy; I think that might nicely tone down the pepper problem. 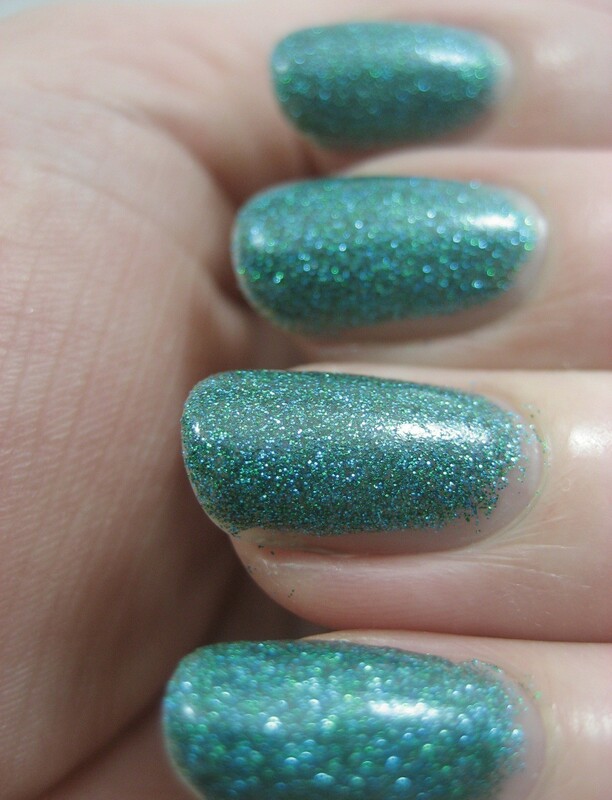 I also think more hex glitter might be in order. A couple of weeks ago I shared the new Finger Paints displays; today I've got swatches and comparisons of some of those colors. 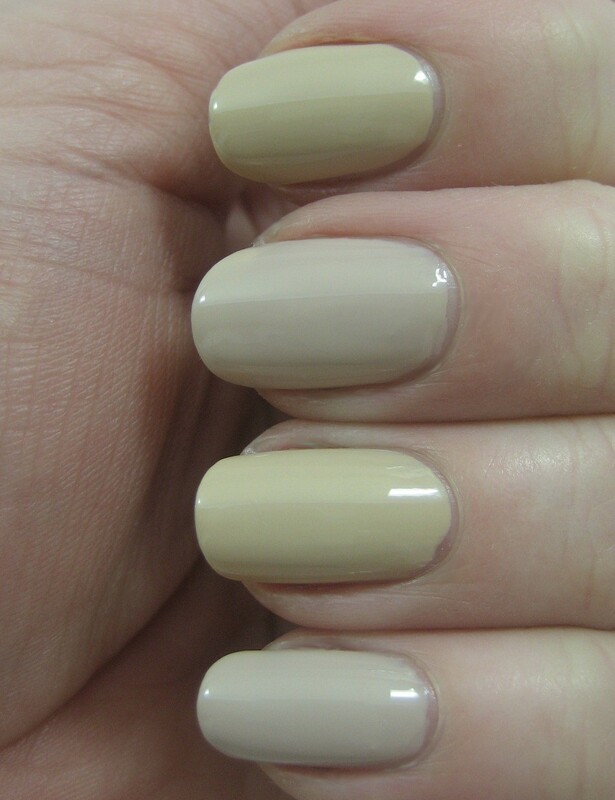 Hue Are You is a taupe creme (the name has a question mark at the end but I don't play that). 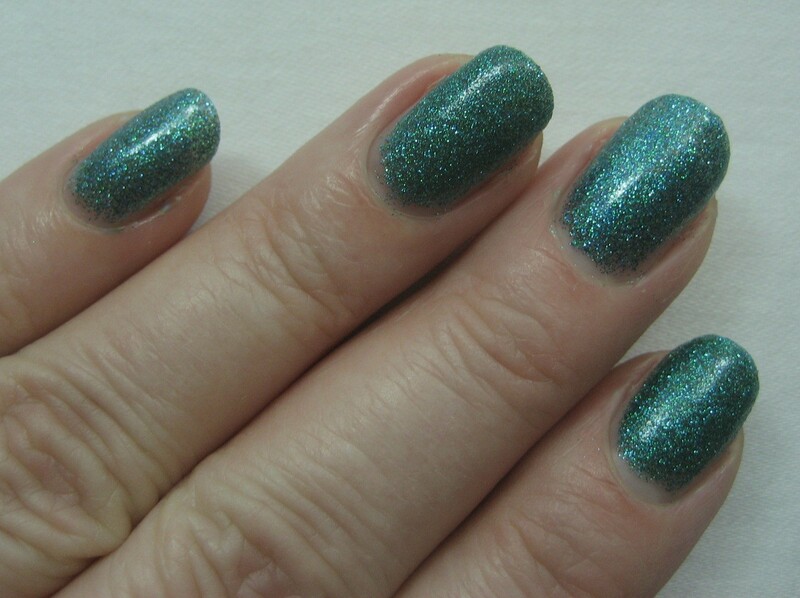 It's nicely pigmented—two coats were plenty—and pretty shiny even without topcoat (as usual, all of today's swatches are without topcoat). 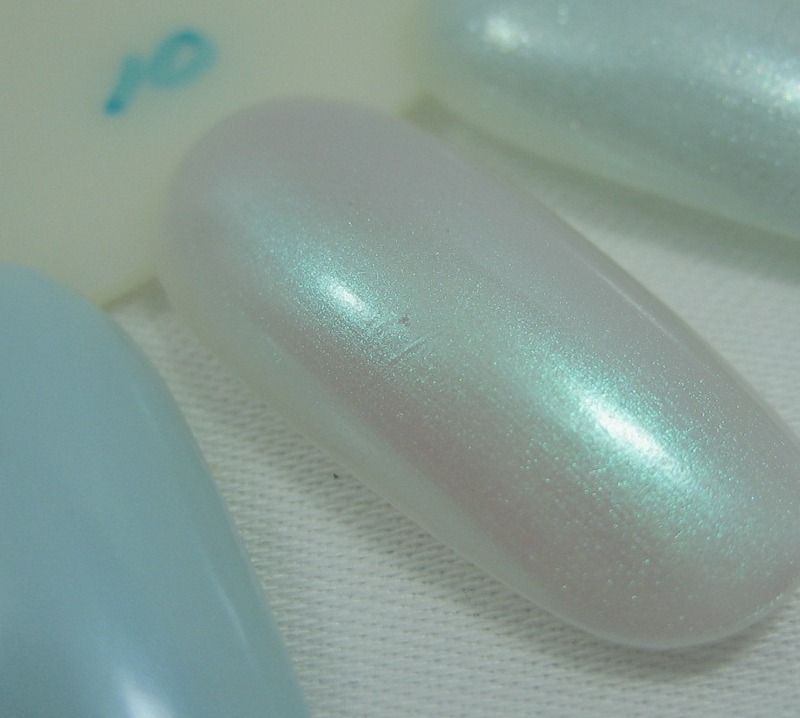 This one reminded me of OPI You Don't Know Jacques. 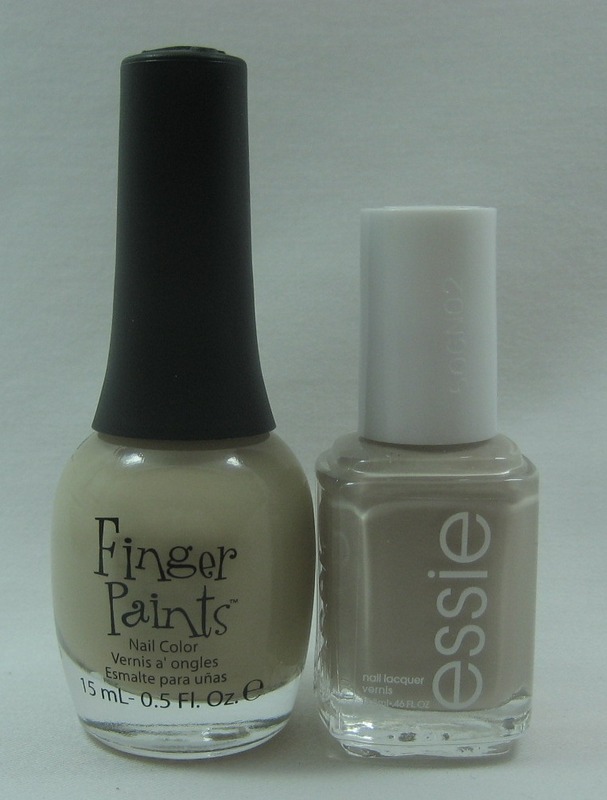 When I got them side by side, though, I could see that Hue Are You is definitely warmer than the OPI. Top to bottom: Hue Are You, You Don't Know Jacques, Hue Are You, You Don't Know Jacques. 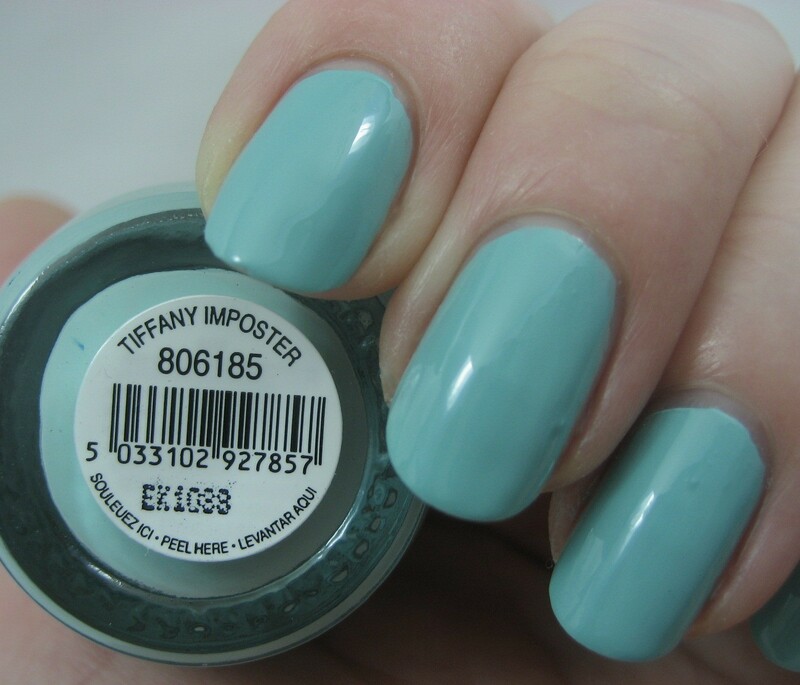 I criticize shade names all the time, but I think Tiffany Imposter is a perfect choice for the turquoise blue creme added to the Finger Paints lineup. It leaves no question about what color they're going for and admits it's not the real thing. This was also a two-coater for me. 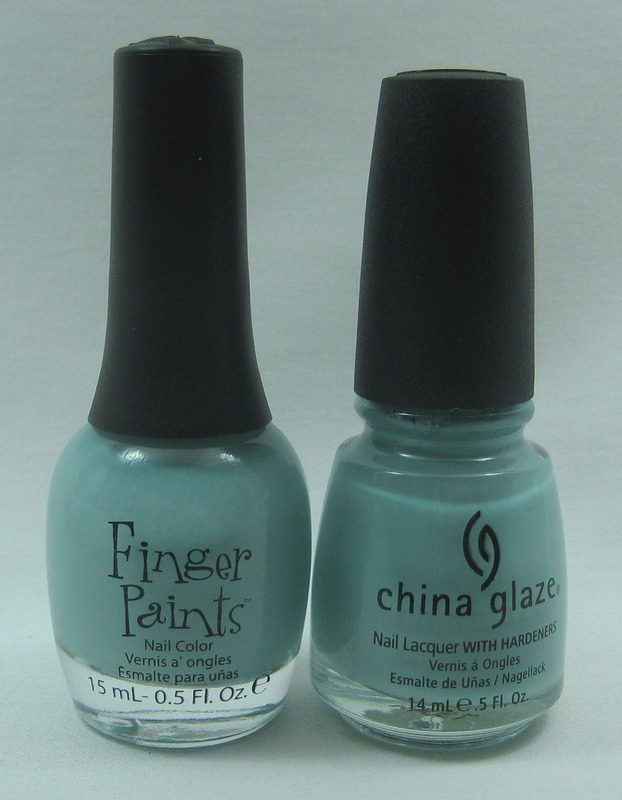 Of course I had to compare Tiffany Imposter to perhaps the best known attempt to replicate Tiffany Blue in nail polish, China Glaze for Audrey. I had a really hard time telling the the two of them apart. I'd give a slight edge to the China Glaze based on the formula, which went on a bit more smoothly, but the Finger Paints didn't give me any trouble, really. Top to bottom: Tiffany Imposter, For Audrey, Tiffany Imposter, For Audrey. The light tan creme Don't Make a Scene is up next. 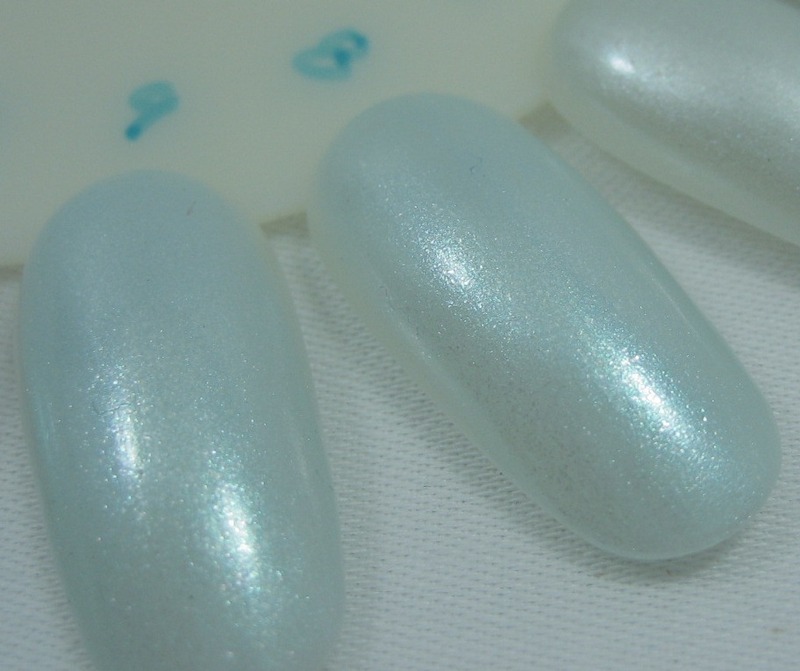 I used three coats of this one, but probably could have done two if I'd been more careful with my application (I just assumed it was going to take three since it was such a light color). 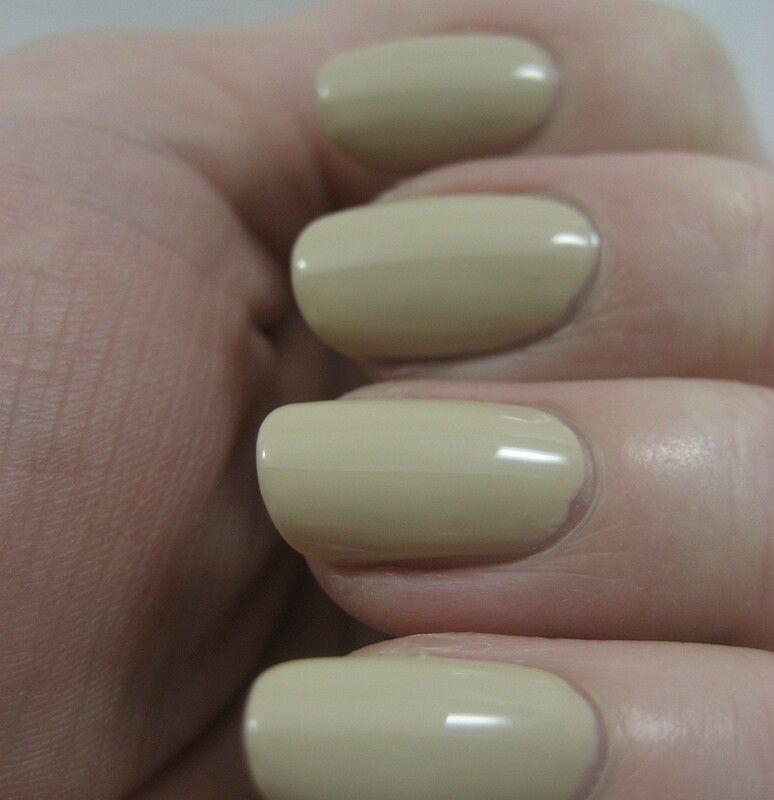 I usually shy away from warm-toned tans like Don't Make a Scene, so the closest thing I could think of to compare it to was Essie Sand Tropez, but they aren't close at all. Next to Sand Tropez, Don't Make a Scene looks almost yellow. Top to bottom: Don't Make a Scene, Sand Tropez, Don't Make a Scene, Sand Tropez. The green creme is called Go Van Gogh (which might also be a good title for an action adventure cartoon featuring famous artists). 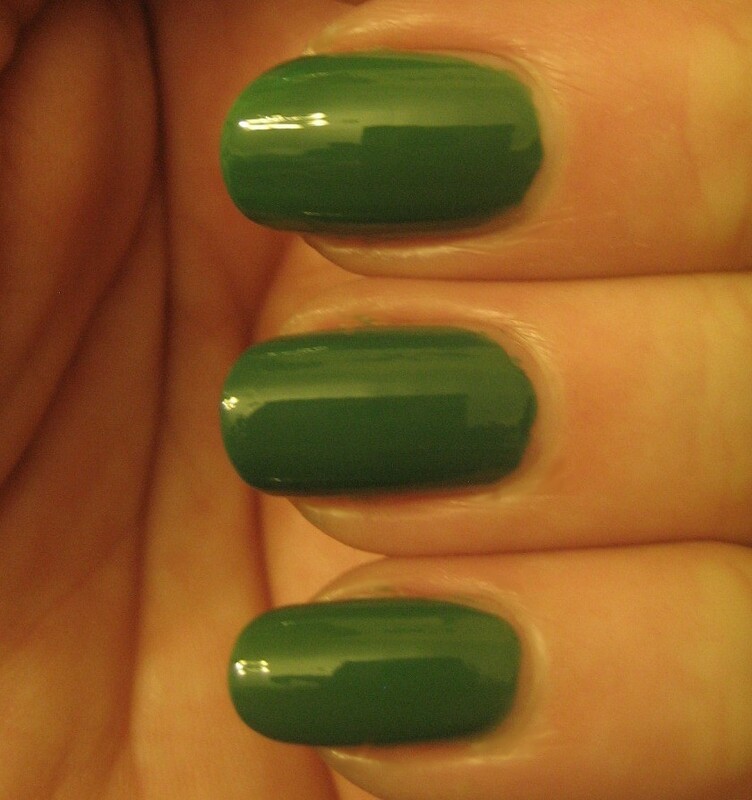 Because I like greens a lot, I had two comparison candidates at the ready: OPI Jade is the New Black and Sinful Envy (I am quite done with green polishes having the word envy in their names). Go Van Gogh turned out to be a touch darker and dustier than the other two, though in low light it's hard to tell a difference. 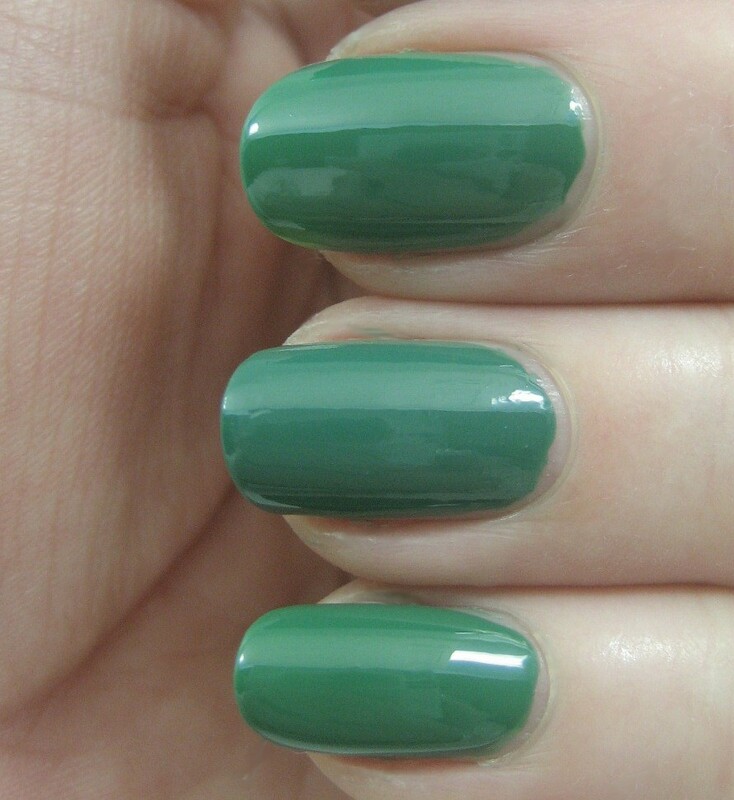 Actually, Envy looks like a pretty good substitute for Jade is the New Black in all lights. 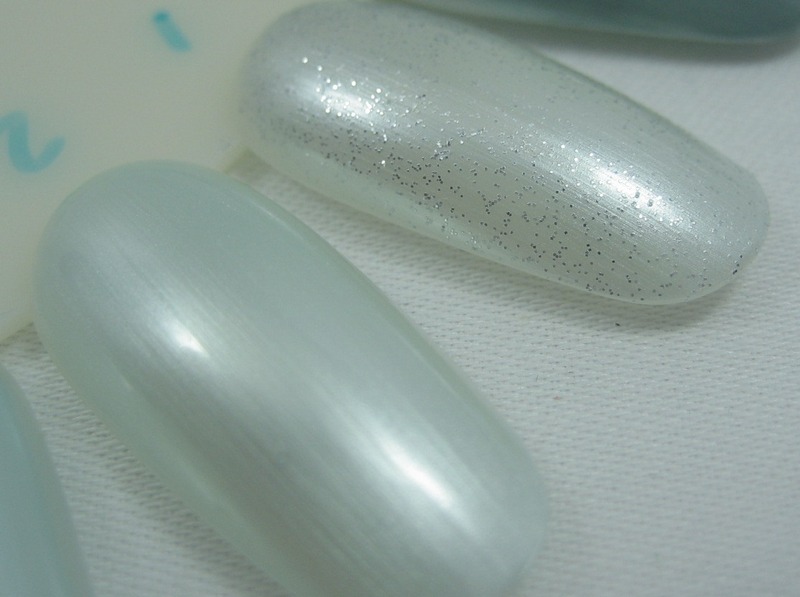 These took two coats each. 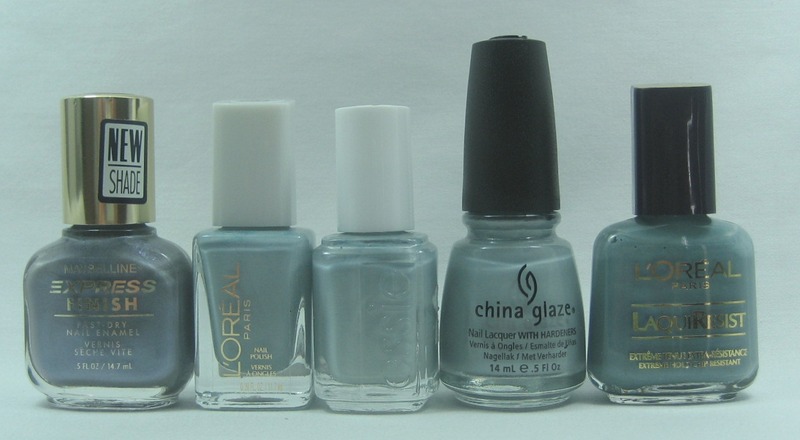 Top to bottom: Jade is the New Black, Go Van Gogh, Envy. All You Need is Color is from the summer display rather than the new colors one, but a bottle comparison indicated it's the same as Art You Wondering (amazingly, I managed to resist buying both just to make sure). 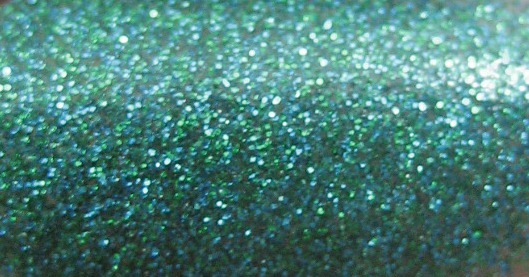 When I bought it, I thought it was a turquoise glitter, but it's actually a mix of blue and green which gives it a nice depth. 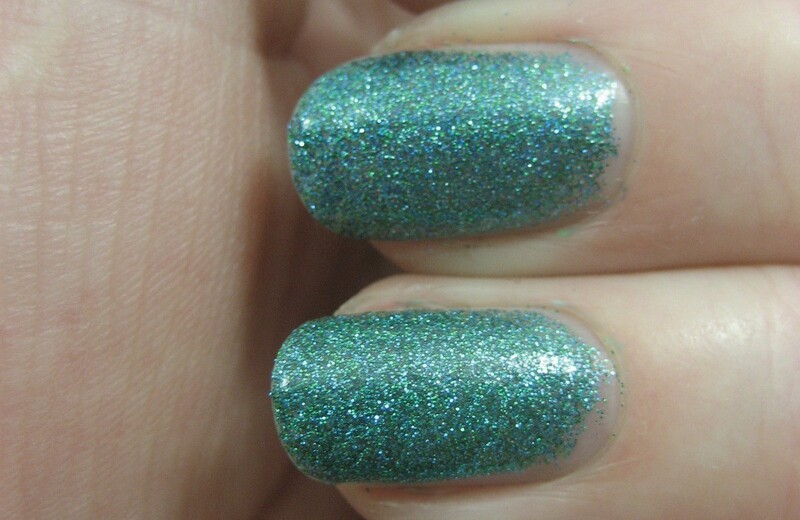 Also, for a glitter, it's not too bumpy, even without top coat. 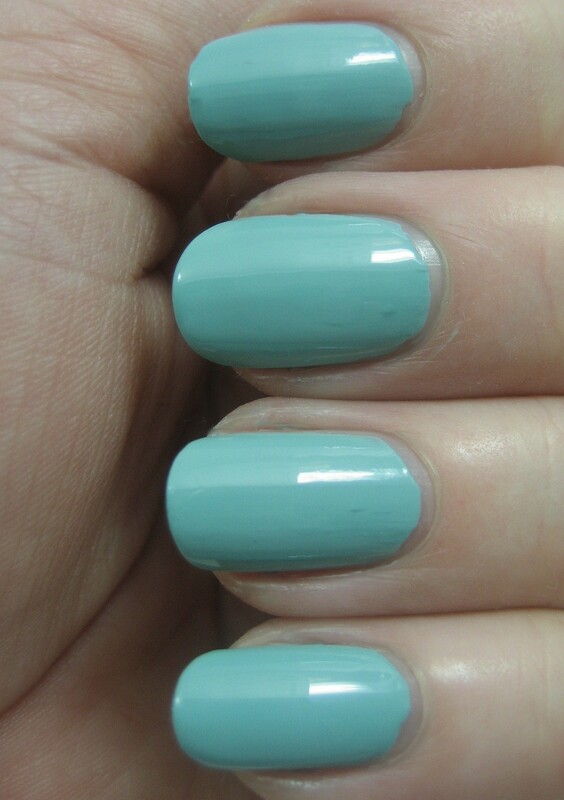 When I saw the blue and green mix, I thought of Butter London Henley Regatta. 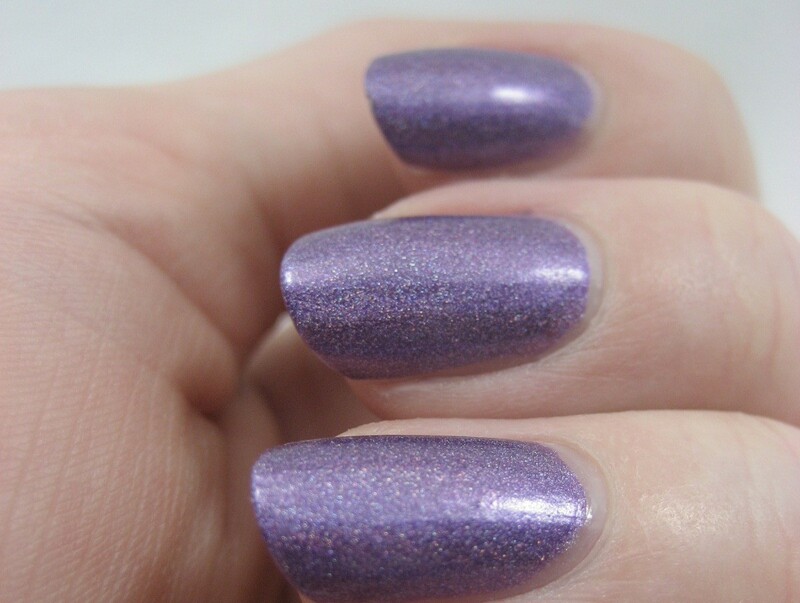 When I got them on my nails together, I was surprised at how close they were; looks like Finger Paints has come up with a better substitue than anything I found when I did my Henley Regatta comp back in February. 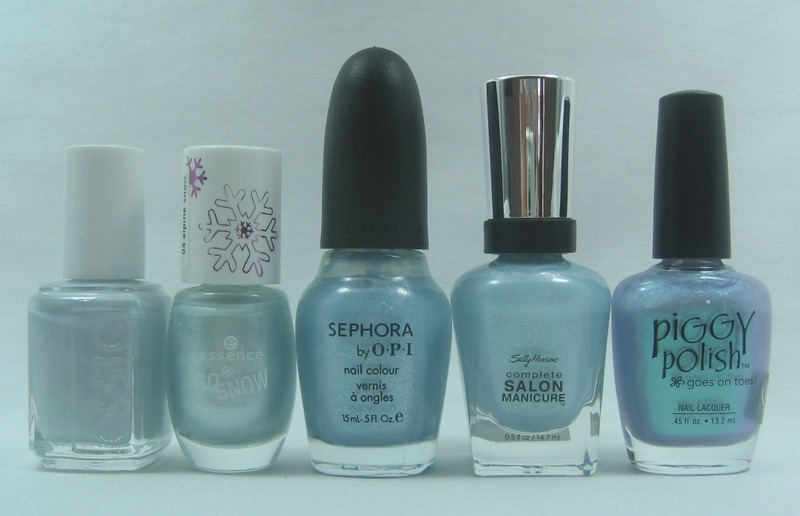 They're not exact dupes; the Butter London leans more toward blue and the Finger Paints more toward green, but it's not a big enough difference to be obvious unless you're really studying and looking for one. 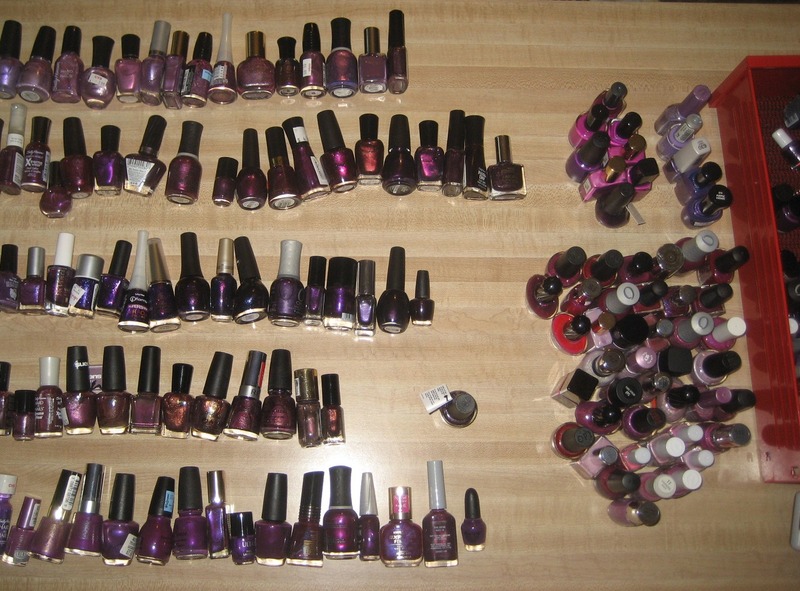 If I didn't already have the Butter London, I'd go for the Finger Paints. 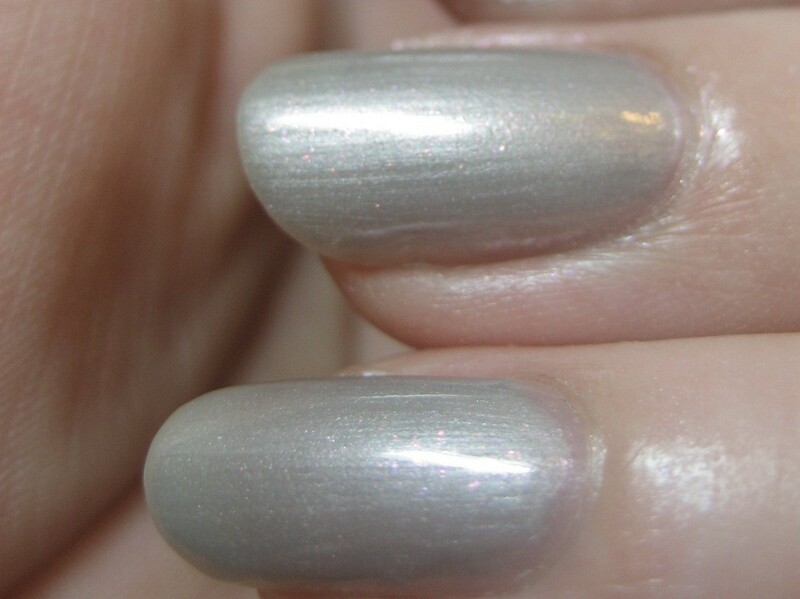 All You Need is Color took only three coats to match the opacity of four coats of Henley Regatta, and it's about one-third the price. 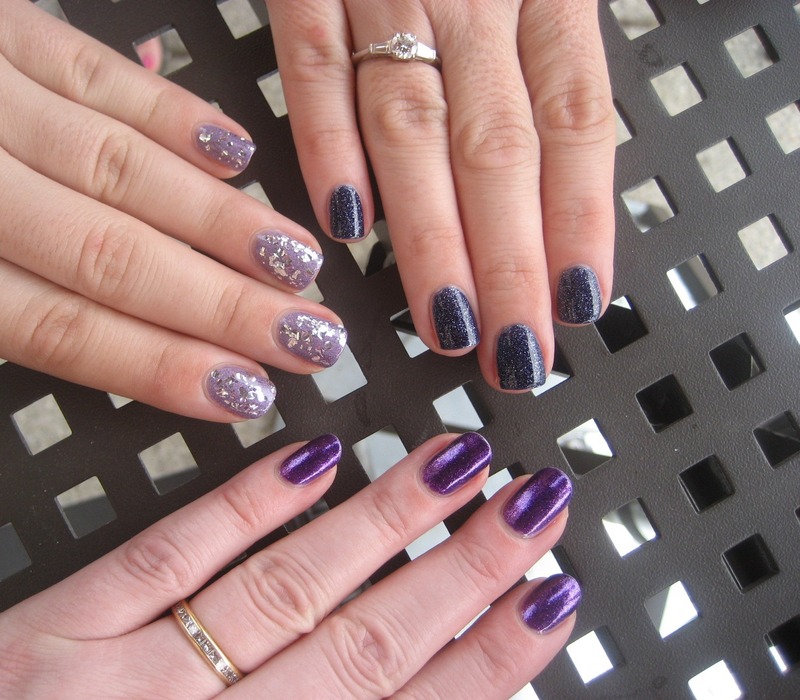 Left to right: Henley Regatta, All You Need is Color, Henley Regatta, All You Need is Color. Top to bottom: Henley Regatta, All You Need is Color. 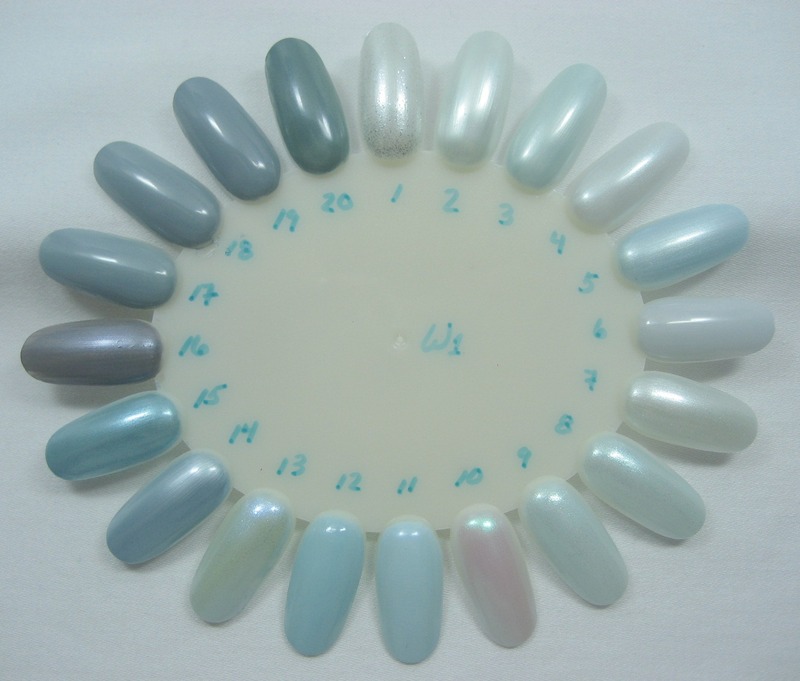 All in all, the Finger Paints aren't breaking any new ground with these new colors, but they are providing some reasonably priced alternatives to more expensive polishes. I would have bought individual bottles if I could have, but by the time I'd decided to stop hunting them in stores, the colors I wanted most were sold out and only available as part of the display package. Thus I ended up with way more Tronica than I planned, but swapping and my recent contest have pretty much taken care of the excess. 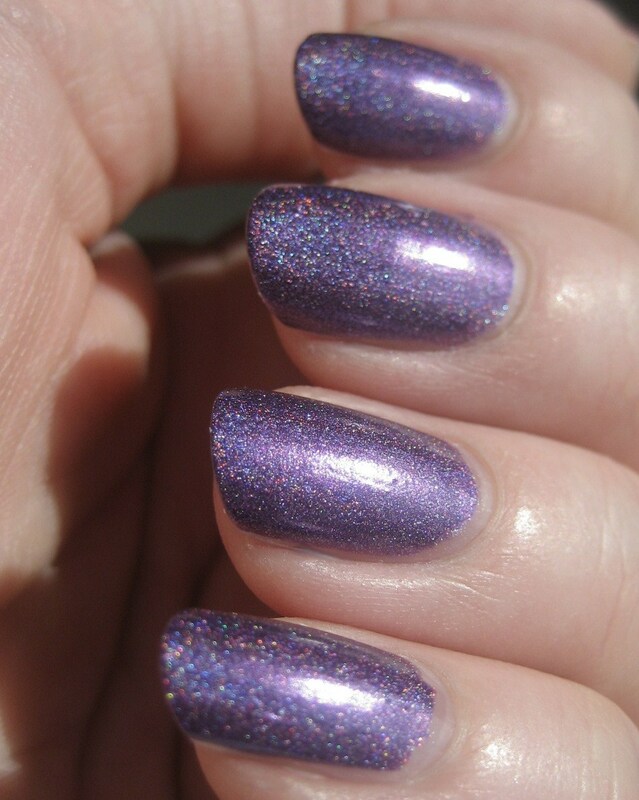 Here's my curent favorite from the collection, Virtual Violet. 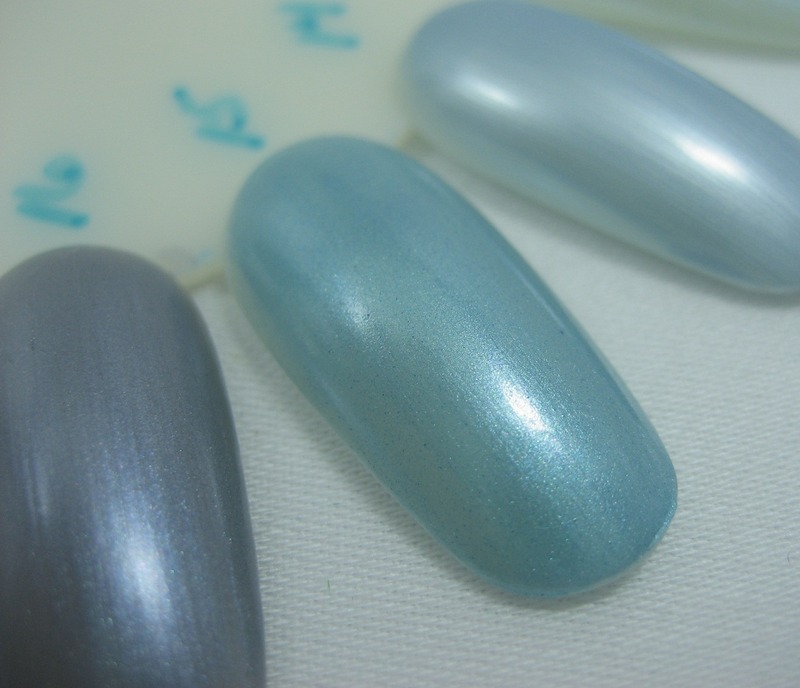 It was almost a one-coater; I did two because I never expected it to be as pigmented as it is so didn't do a great job applying the first coat. 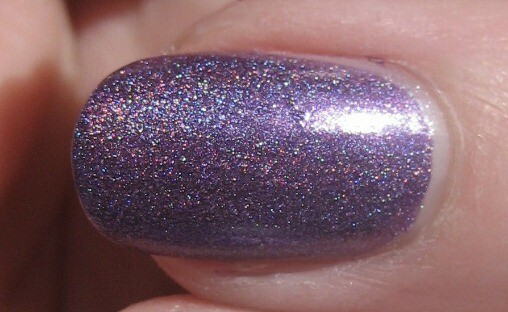 In the indirect indoor illumination of my light box, the holo was pretty shy, as these next two photos show. In the sun, which every so often does put in an appearance around here in between rainstorms, the sparks of rainbow colors pop out. 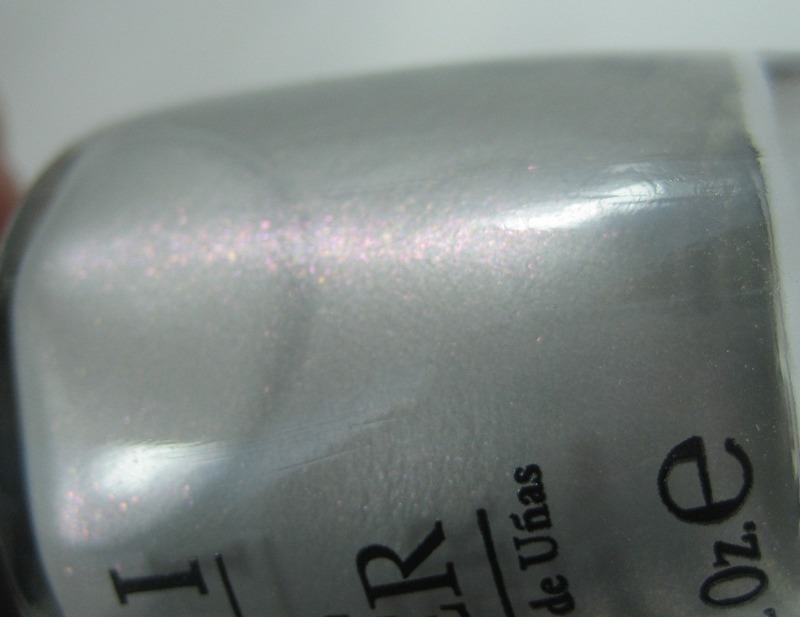 I can appreciate scattered holos, but I hope down the road we see a reappearance of linear holos, the same way we're now getting crack all over the place after not seeing any new releases of it for years. This week's Nail Wheel Wednesday got delayed because I got distracted by many things, including putting together new Helmers, which I do not intend to use for long term polish storage but rather as a more attractive and accessible temporary home for the bottles I'm weeding out than the cardboard boxes they've been in. When I've got my stash back to a more reasonable (to me) size, I'm sure I'll find something else to do with the excess Helmers. I skipped ahead in the order of wheels because looking at these blues was a nice stress reliever, and I needed that. I didn't want to wait until my next vacation to try another pattern of the Sally Hansen Salon Effects strips, so when I saw a week on my calendar when it looked like I probably wouldn't have time for a mid-week polish change, I went for it. 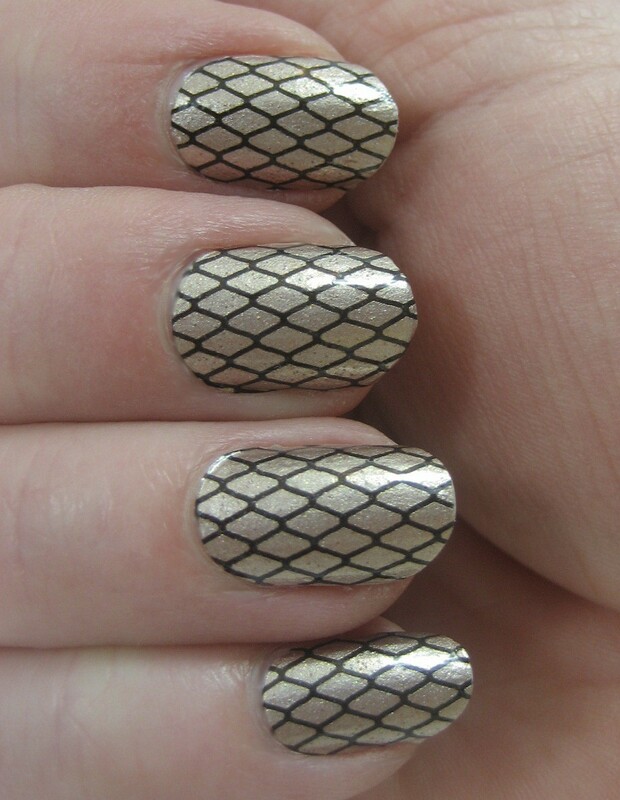 I chose the black and gold fishnet design, which for some reason is called Misbehaved. I guess Sally thinks naughty girls wear fishnets. I did a better job putting them on than the first time I tried them. My centering skills still need work, but I only got wrinkles on one nail and didn't gouge any of the strips when smoothing them down. 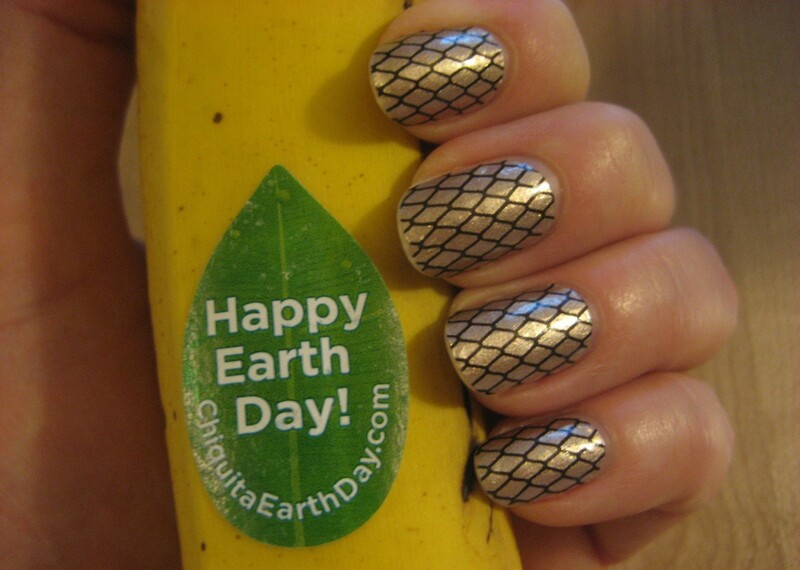 As for the banana, I used to collect banana stickers, though now I just take pictures of them sometimes. This one caught my eye because it was long after Earth Day.